Or only about 315 days until you need to start using this advent calendar. 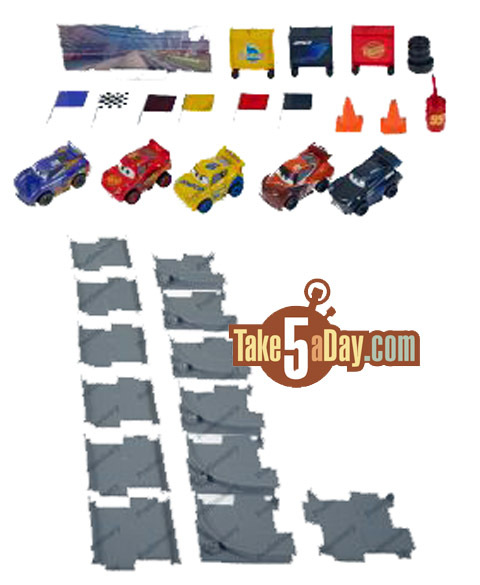 Sorry, only a tiny blurry pic – the accessories are all scaled to the 1:55 series – what’s new is the tool chest for Jackson Storm and Cruz Dinoco. The sign is new (I guess it’s 3 or 4 days that assemble into one sign?) – I think the gas can & tires are from the Demo Derby pack from last year. The Mini’s are probably all repeats though it’s hard to say 100% at this resolution. As for the grey plastic things? No idea, do they assemble as a track? Seems likely but unknown – hard to tell at this resolution. Last year’s calendar and pics.